L-Cpl Charles E Scott's "From Vietnam With Love" is one of the strangest of all the "Soul of Vietnam" records. Purporting to be recorded live in Chu-Lai the disc consists of a recitation by Scott to his girl friend back home over a guy strumming a guitar playing "As Tears Go By", punctuated by the intermittent sounds of gunfire and larger explosions. Scott put it out on his own Attack label from Richmond, VA. 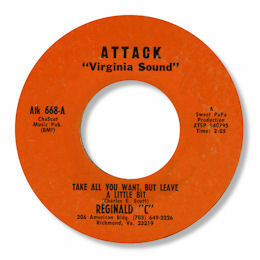 He released a couple of more standard soul 45s as well by artist like Jimmy Wonderful including this one from the obscure Reginald C. Scott's own Take All You Want But Leave A Little Bit is a fine example of "little label" soul - a guy with a strong voice fighting low production values and zero promotion. Typically the mix is all over the place - the drums and guitar are barely audible while the bass is way too high - but the backing singers are first class and the horns nice and crisp. Note ~ You can find "Take all you want" on the Arcadia International CD "Ol' Virginia Soul - Encore".